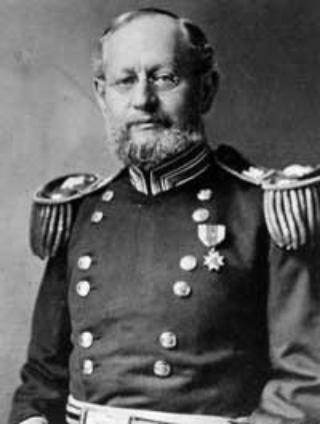 Henry Martyn Robert was called on in 1863 to preside at a meeting. He was 26 years old, a civil engineer in the U.S. Army. He was reluctant to decline the call, but he did not know how to preside at a meeting. He accepted the duty hoping that his lack of knowledge would not be an embarrassment to himself or a disservice to those at the meeting. We don’t know exactly what happened at that meeting, but we do know that he determined then to learn something about parliamentary procedure before he attended another meeting. Over time, he developed a pocket manual of parliamentary procedure that was to be published in 1876 and which became known as “Robert’s Rules of Order”. Since then, his work has gone through two revisions in eleven editions. The current title is Robert’s Rules of Order Newly Revised (abbreviated RONR). The current edition is the 11th edition (Sept. 2011). There are numerous publications titled “Robert’s Rules of Order” or some variation thereof (including online versions of outdated editions that have fallen into the public domain), but when your parliamentary authority is defined as “Robert’s Rules of Order,” (without specifying a particular edition) the book to which it correctly refers is Robert’s Rules of Order Newly Revised (RONR) (11th edition, 2011). You can obtain your copy here. For one who will brave it, RONR is written to serve as a self-explanatory text that can be read through, with topics presented in an order that will best convey an overall understanding of the entire subject matter. You need not apologize, however, if you find that to be a bigger project than you would like to take on at this point. If you are such a person, and want to know how to get by in a meeting or as a club president, this brief book is for you. 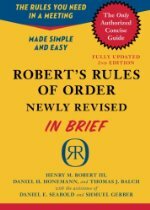 Get your copy of Robert’s Rules of Order Newly Revised In Brief here. 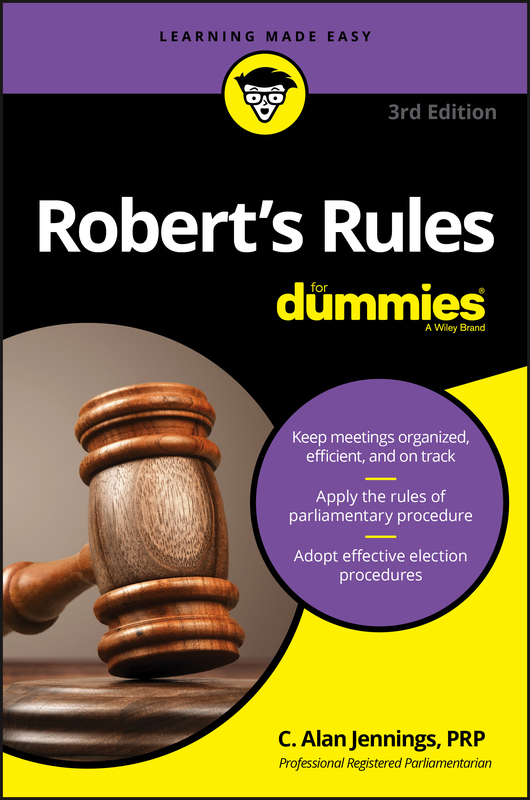 This book is my contribution to the universe of books about parliamentary procedure in general and Robert’s rules in particular. I wrote it to help make a daunting subject somewhat easier to grasp for those who need to gain a basic understanding of the fundamentals quickly. 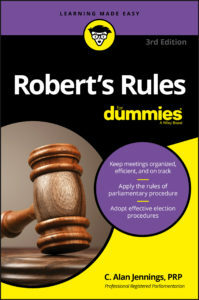 Robert’s Rules for Dummies isn’t a parliamentary authority. It’s a book about the parliamentary authority. It is intended to serve as a companion to the real Robert’s Rules. For a little more info about my book, click here.